Can you touch your nose with your right index finger? Unless you've been drinking lots of alcohol or have damage to the cerebellum in your brain you shouldn't have a problem. So you may be surprised when you start to consider how complicated the brain activity is that allows you to fulfil this simple motor command without a second thought. The light reflected off the computer screen enters your eyes, where the retinas interpret the image and encode it into electrical impulses to be sent to the sensory cortex of your brain. Lots of cross talk between different brain areas is needed for your brain to impart meaning to the perceived word images, then for the higher control centres to decide what to do. If you decide you want to fulfil the command, then the motor cortex in your frontal lobe has to co-ordinate precisely with your cerebellum and basal ganglia, so that nerve signals tell your hand and arm muscles to contract, while the precise timing, sequence and duration of each muscle contraction is timed, so that the various muscles will contract and deploy smoothly. The complexity of gross and fine motor control underlying our every action is quite astounding, especially when you consider that the human body contains at least 600 muscles that move a skeleton of over 200 bones. Our brains process input from our senses (vision, hearing, touch, smell and taste) and control output, much of which is motor, mediated by the contraction of many muscles. The motor cortex is the brain area most involved in controlling our voluntary movements (those that we consciously decide to perform), as opposed to involuntary movements, like rapidly withdrawing a hand from boiling water, which occur automatically due to reflexes involving the spinal cord, without higher brain input. The motor cortex is in the rear part of the frontal lobe, just before the central sulcus, (an indentation separating the frontal from the parietal lobe.) This region acts as a control centre, where information is received and integrated. The parietal lobe supplies information about the body's position in space, the frontal lobe plans the goal of the movement and the temporal lobe supplies memory about past strategies. In the 19th century, experimenters found that different body parts contracted when different areas of a dog's motor cortex were electrically stimulated. When they destroyed parts of the cortex, the corresponding body parts became paralysed. In people as well, a stroke that destroys some of the motor cortex, can leave the body parts controlled by that area paralysed. Every part of the body has a particular region in the motor cortex that controls its movement. The parts of the body that perform the finest movements take up the most space when the motor cortex is mapped. Correspondingly, those that perform gross movements only take up little space. So a pictorial "motor homunculus" in whom size of body parts is proportional to size of the brain area controlling them, appears grotesque, with a huge hand, thumb, face, mouth and tongue and small legs and feet. This reflects our two most astounding evolutionary adaptations - language and the human hand. Unlike any other species, we have opposable thumbs, which allow us to perform extremely precise movements and fashion and handle tools. The ability of our ancestors to talk and to touch their thumbs to each finger in turn is quite possibly the reason that we are no longer swinging from the trees. The basal ganglia lie deep in the cortex of the brain and act to select and trigger co-coordinated movements. Parkinson's disease typically affects this region, so patients have problems starting the movements they plan and trembling and slowness once they begin. 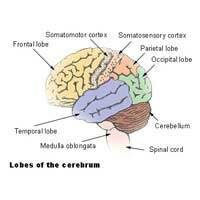 The cerebellum constitutes 10% of the brain's volume, but contains 50% of its neurons. It lies at the brain base, where it receives a copy of all sensory information entering and all motor signals leaving the brain. It acts as an internal clock, timing and co-coordinating movement. If you touched your finger to your nose, then your cerebellum gathered all the information about the position of your hand, arm, nose, their speed of movement and any obstacles and integrated it all so you could complete the task. When the cerebellum is damaged or depressed by alcohol, people become clumsy and have difficulty keeping balanced. If they try to grasp something, their hands start moving late, advance shakily and stop short of or after the target. In the casualty department, a busy doctor can quickly detect signs of cerebellar problems by using the "finger nose" test. Since our every little movement relies on such remarkable complexity of brain activity, there are those who believe that it is easier to understand how a space shuttle works than to comprehend the movements made by the astronauts as they climb aboard!